Winter is passing. Only ten days ago, an ice-wind specked with hard and freezing rain howled over deep drifts of snow, crusted and crackling. The trees were coated with ice. It’s been an uncanny time. Before the drifts arrived, the snowdrops lay down in the sudden freezing wind and gave up, it seemed, but they are bouncing back now, eager again in the mists and rain of early Spring. Winter is the dreaming season, they say, but there has been little space for dreaming and time for new writing is scarce. Being a creative parent of a young son means that time for word-work slips quickly down the agenda of Vital Things, below the demands (and joys) of parenting and the pressure of the urgent pennies and pounds to be brought in. 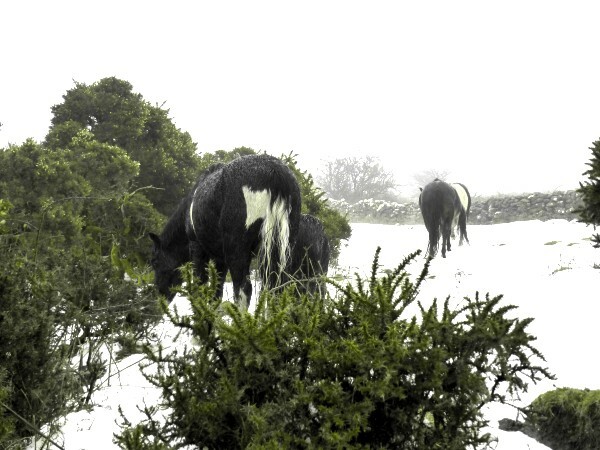 When I can, I walk out on the wild moor with a dictaphone in my pocket, praying through my wind-chapped lips and recording what gleanings I can, caught on the wind, found on the cairns and in granite caves or kists. I am building a store of recordings, my voice often hardly audible over the howl of the moor or the lash of rain. Those recordings are my life-line, and new work is building from them, slow as Spring, hopefully as certain. It seemed like the perfect time to bring out the next book. I’m delighted to announce that I’ve got a new pocket-sized chapbook out with Hedgespoken Press this week. NETTLE-EATER is a piece of writing that has been nagging away at me for a long time and so, over this Winter, I’ve been working on polishing the text and designing this little book, the same size as SOMETIMES A WILD GOD, but different. The first 500 copies are a limited edition chapbook, signed and numbered and riso-printed in green ink in the UK on recycled stock. I’m very happy with this creation. 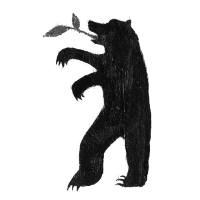 Click through to find out more and buy Nettle-Eater. 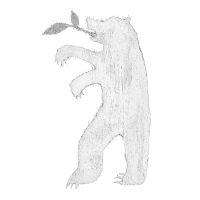 Help support my efforts, buy me some time to write and turn those moor-recordings into new books! Official publication date is Tuesday this week, and then we’ll be announcing the launch all over the usual channels, but I thought you might like to know in advance. 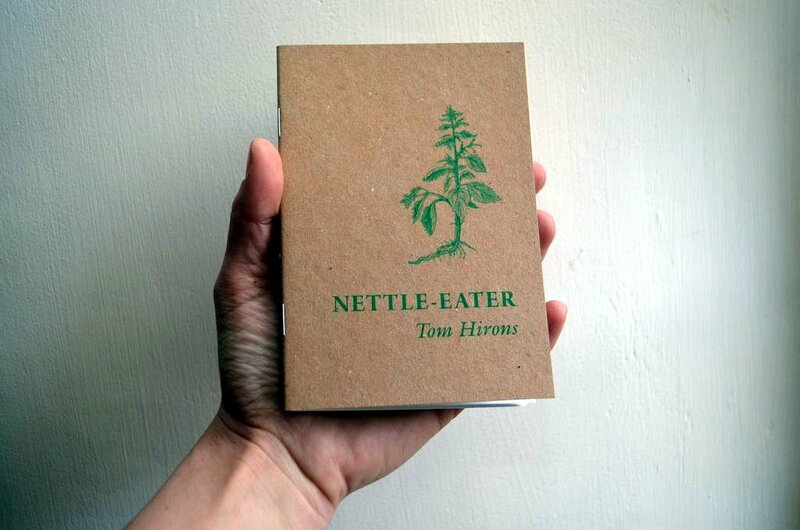 There's a link to the full text of Nettle-Eater on the shop page. You almost certainly already know about Sometimes a Wild God. We’ve sold almost 4000 of these little books online and it keeps bread on the table and socks on our feet. Please ask your local bookshop if they’d like to stock it. What you might not know about are the A3 poster or the recording I made of it the day we took to the road with Hedgespoken, both available from the Hedgespoken shop, along with all sorts of other fine works, including marvellous art by Rima Staines and the extraordinary books of Sylvia V. Linsteadt. Click the button to see all the possible versions of Sometimes a Wild God in the Hedgespoken shop. I’m planning to run some storytelling workshops this Spring, in the southwest of England and more widely if there’s demand. If you’d be interested, please get in touch and I can start planning where and when. 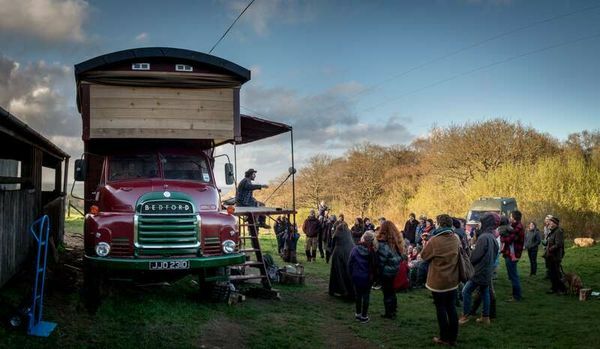 I can’t promise I’ll bring the mighty Hedgespoken truck (pictured above) but I’ve learned a few things from storytelling on the road that I’d love to share. Care to join me? There’s more, of course - there’s always more. I’m re-writing a novel, first written a long time ago. It’s a big story being re-told, moulded and honed, pared away to its difficult core. There is a boy who gives his soul to a falcon, who dreams a child into half-life. There’s a world of trouble. That’s all I can tell you, for now. I’m also working on the final draft of text for a retelling of The Firebird to go with beautiful illustrations from Rima. More on that in due course - it’s going to be a delicious feast of a book. I’ve seen the illustrations and they’re stunning. I’m hoping to start more regular updates as I get down to more new work - there’s also a podcast in the offing, an exploration of words and language and land and magic... But, this is the news for now. I hope the changing season treats you well and that your course is strong as you steer into the strange weather of the year-clock’s next quarter. You’re on this list either because you signed up via the website, tomhirons.com, or because you have bought a copy of one of Tom’s works in the Hedgespken Shop - apologies if I’ve added you in error. You can unsubscribe using the button above and I won’t trouble you again.